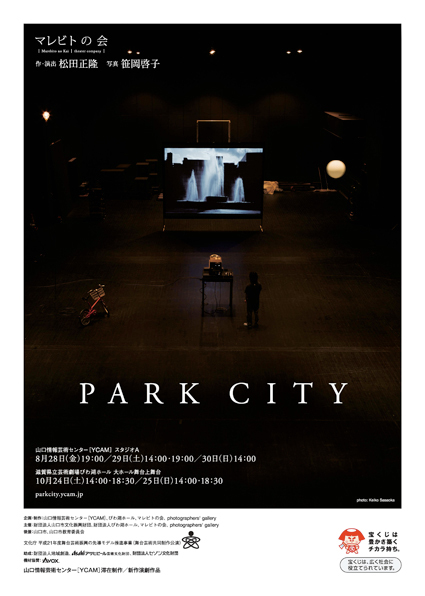 A new experience that defies the conventional idea of "theatre"
Masataka Matsuda (playwright/director, Marebito-no-Kai) and photographer Keiko Sasaoka (photographers' gallery) unveil their new theatre piece "PARK CITY" at the Yamaguchi Center for Arts and Media. This YCAM original production is a result of Matsuda's stay in Yamaguchi as part of the "Work-in-residence" program exploring the possibilities of artistic expression together with the Center's expert staff -YCAM InterLab-. "PARK CITY" experiments with temporal, spatial and physical sensation by combining stage art with photography and media technology. Masataka Matsuda, a leading Japanese playwright/director since the 1990s, has received numerous awards for his experimental work exploring the possibilities of stage arts with the theatre company Marebito-no-Kai. In his newest creation, he captures scenes of the city with the help of Keiko Sasaoka, a young photographer regarded for her original approach. 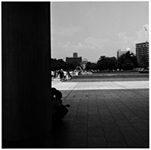 The two artists illustrate through texts and photographs the latent memories of the city of Hiroshima as it was re-erected around a "monument" in the form of a park after the war. Seats in the theatre are deliberately placed at a distance from the stage, and equipped with individual video screens. This alternative viewing style enables the audience to enjoy a new form of theatre with text, photography, sound and imagery transcending the boundaries of time and space. Look forward to a radically new type of stage production that incorporates Masataka Matsuda's script and direction, Sasaoka's photographs, and YCAM's own cutting-edge media technology. 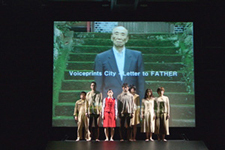 Copyright © 2010 Yamaguchi Center for Arts and Media, All Rights Reserved.